Sublimation is an additional process that complements traditional lacquering. 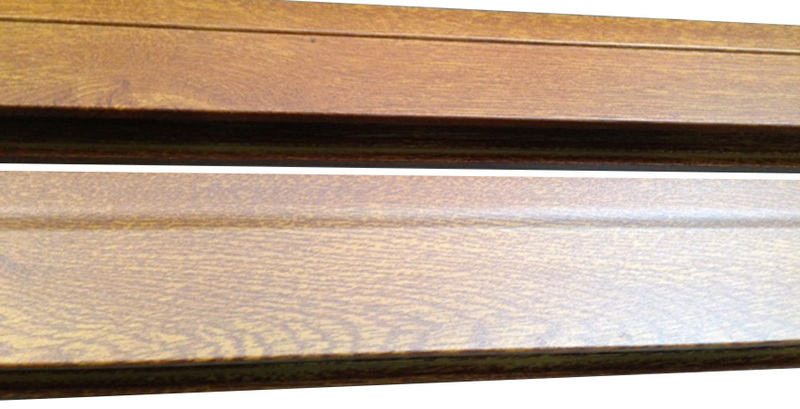 It is used to produce an accurate imitation of different types of wood on metal profiles and sheets. The aluminium profiles are subjected to the heat transfer process (also known as thermal printing) which is based on the physical effects of sublimation. This phenomenon consists of heating a substance which moves directly from solid to gaseous state, and after cooling hardens within the synthetic layer formed by the paint previously applied to it. The next stage is to roll up the aluminium profile inside the printing paper, which has cellulose resins and colorant and put it onto a conveyor with silicone rubber membranes, which create a vacuum so as to ensure perfect adaptation to the shape of the profiles. The trolley is then placed in an oven at a temperature of between 190 ºC and 210 ºC where sublimation takes place. There are various different transfer papers which when combined with the powder coating colours used as the base allow us to obtain various different wood finishes: pine, walnut, oak, sapele, etc.